In sports, the home court advantage is a significant factor that can provide the host team a winning edge in a close contest. After playing on the other guy's field for a decade, Illinois Republicans are hoping home court districts now will help them break the Democrats' 10-year stranglehold on the Illinois General Assembly. Nervous Democrats, meanwhile, are learning how to play big-league politics in definitely unfriendly confines. Both the GOP optimism and the Democratic apprehension stem from Redistricting '91, the epic struggle to fix boundaries for Illinois Senate and House districts for the next decade. Many rank-and-file Illinoisans might consider themselves mere spectators to what is essentially a partisan contest, but its outcome is certain to affect their lives more profoundly than any World Series, even in the unlikely event that a Chicago team might be competing. School funding, property tax relief, the level and mix of state services — these are but a few of the critical issues that will confront the General Assembly over the next decade. On these and other key questions, the two major parties offer vastly different responses, and the state's quarrelsome regions often have conflicting interests. Whichever party controls the gavel — and whichever region wields the greatest political clout — is likely to see its point of view prevail. 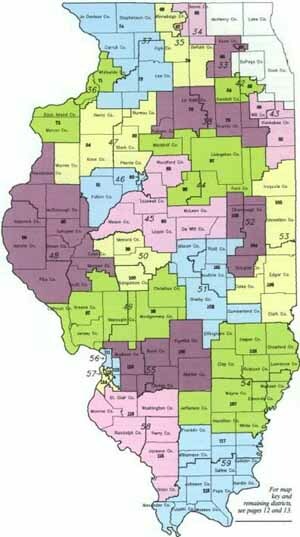 Political cartography has immense potential to tip the balance in someone's favor, with significant consequences for the average Illinoisan. 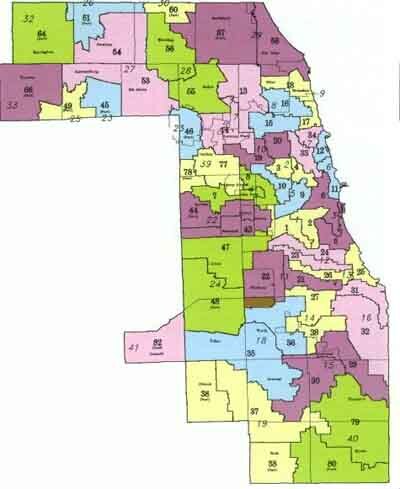 In Redistricting '91, Republicans and suburbanites came up the big winners. The GOP good fortune began even before the U.S. Census Bureau released Illinois population information, the starting point for mapmaking, early in 1991. The Republicans' first break occurred some three months earlier, when Secy. of State Jim Edgar defeated Atty. Gen. Neil F. Hartigan in the 1990 gubernatorial election. Edgar's victory denied Democrats the chance to use their solid legislative majorities to approve a Democrat-flavored map that a Gov. Hartigan would have signed. Instead, the Republican governor predictably rejected the map the Democrats sent him hours before the June 30 deadline. The proposal failed to meet constitutional requirements and was not "politically fair," the governor said in a terse veto message. Edgar's veto placed the GOP's legislative minorities on equal footing with majority Democrats as the task of redistricting moved to the Legislative Redistricting Commission. When the remap panel deadlocked — in retrospect, an inevitable result — and State GOP Chairman Albert M. Jourdan won a drawing to become its tiebreaking ninth member. Republicans suddenly held the upper hand. The resulting redistricting plan, carefully Grafted to produce GOP majorities, overcame its final hurdle earlier this year when both the Illinois Supreme Court and federal courts turned back Democratic challenges. The new map, reflecting population shifts over the last several decades, gives unprecedented power to suburban voters, who for the first time in state history will control more legislative districts than either Chicago or downstate. At the same time, the redistricting plan should transform party caucuses, providing a stronger voice for blacks and Hispanics among Democrats and enhanced suburban influence among Republicans. Coupled with artful redrawing of several downstate districts accustomed to electing Democrats, the suburban shift gives the map a strong GOP bent. So after a decade of taking a back seat to the Democrats, Republicans could be on the verge of seizing the wheel for the 1990s, thanks to Redistricting '91. To appreciate how the GOP cartographers laid the groundwork for a potential sea change in the legislature, it's necessary to take a closer look at the new map's genesis and its political ramifications. More than luck played a role in the newfound GOP ascendancy; the state's changing demographics and federal court rulings to empower minorities also favored Republican interests, while placing the legislature's Democratic majorities in an untenable position. In fact, some Republicans argue the party in 1991 only was reclaiming at last what would have been its rightful place throughout the 1980s, were it not for Democratic artifice. The contention is bolstered by Census Bureau numbers that document the ebb — notably in Chicago — and the flow — chiefly to the suburbs — of the state's population in recent decades. After steady growth for more than a century, Chicago's population peaked in 1950 at slightly more than 3.6 million and has been declining steadily since then, to just below 2.8 million in 1990 — about the same number of residents as the city had during the Roaring '20s. Population in suburban Chicago, however, mushroomed during the same period. A little more than 1.5 million persons lived in suburban Cook and the collar counties of DuPage, Kane, Lake, McHenry and Will, according to the 1950 census. By 1970, however, the suburban population of some 3.6 million was larger than the city's, and the gap widened during the next two decades so that by 1990 almost 4.4 million persons lived in suburbia, almost 60 percent more than in the city itself. For map key and remaining districts, see pages 12 and 13. Under the one-man, one-vote decisions of the U.S. Supreme Court in the late 1960s and the 1971 Illinois Constitution, political clout in the form of legislative seats should have followed the population flow to the Republican suburbs from the Democratic city. 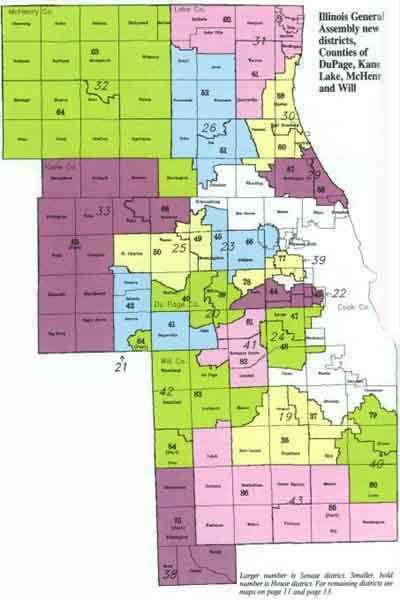 In the redistrictings of 1971 and 1981, Chicago Democrats were able to minimize the erosion of their legislative power by fashioning city-anchored districts that overlapped into the suburbs, absorbing just enough suburban voters to meet the population requirements without in most instances endangering Democratic dominance. The technique worked so well in the 1970s, when one senator and three House members were still elected from one legislative district, that only once was a GOP senator elected from one of the nine hybrid districts and never did Republicans elect two representatives from the same city-controlled district. After the 1980 Cutback Amendment, 59 districts each elect one senator, and all 118 House districts (each Senate district carved into two districts) elect one state representative apiece. During the 1980s, the overlapping tactic proved less effective in redistricting when 10 overlapping districts were needed to avoid the loss of more than one district to the suburbs because of the city's ongoing population drain. By decade's end the GOP held Senate seats in two of the hybrid districts — the 7th, with Sen. Walter W. Dudycz, and the 24th, with Sen. Robert Raica, both Chicagoans — while Rep. Roger P. McAuliffe (R-Chicago) had won five elections in the hybrid 14th House District. Thus, heading into Redistricting '91, there were signs the overlapping technique already was reaching its limits in preserving safe city districts for Democrats. Additionally, the new map would have to meet federal court mandates based on the U.S. Voting Rights Act, which essentially required the creation of as many black and Hispanic districts as possible. In trying to fashion minority districts, Democrats faced a wrenching task in the face of Chicago's shrinking populace, as the city's minority neighborhoods were among those losing the most residents. Illustrating the problem, a Democratic analysis showed the city's existing black districts were among those farthest below the ideal population figures of 193,740 for the Senate and 96,870 for the House. Larger number is Senate district. Smaller, bold number is House district. For remaining districts see maps on page 11 and 13. In the Senate, five of Chicago's six black districts had the largest shortfalls in the state, averaging 31,000 fewer residents than needed. Taken together, the six needed almost 174,000 additional people to reach the population target. The gaps were similar in the House, where the city's 13 black-majority districts were almost 190,000 residents shy of the target numbers. The state's only Hispanic Senate district also missed the population target by almost 10,000 persons. But the census revealed large enough concentrations of Hispanics on Chicago's near northwest and near southwest sides to create two Senate and four House districts with Hispanic majorities if mapmakers wished to do so. The only place to find the thousands of new people needed to preserve the minority districts and to create additional Hispanic seats was to take them from neighboring districts with white incumbents, in a game of political musical chairs that inevitably would push some sitting lawmakers into intramural competition or unfriendly suburban territory. Among those likely to be squeezed were such names as Rock, Daley, D'Arco, Burke, Lechowicz, Savickas — not exactly small-time players in city politics. Moreover, the numbers were down by some 19,000 in two Cook County Senate districts — the 26th and the 39th — where significant black populations helped Democrats maintain a lock on both the Senate seats and three of the associated House seats throughout the 1980s. The census offered precious little cheer for Democrats elsewhere, either; only 5 of 31 Senate incumbents and just 17 of 72 House members were in districts that measured up to the population yardstick. For Republicans, though, maximizing black and Hispanic strength posed no real problem; their incumbents would be little affected by how district lines were drawn in the minority neighborhoods of Chicago and Cook County. Indeed, the suburban population explosion documented in the census left most GOP lawmakers with folks to spare back home that could be molded into new, likely Republican, districts. Larger number is Senate district. Smaller, bold number is House district. For remaining districts see maps on page 11 and 12. A half dozen suburban Senate districts — all with Republican incumbents — had 44,000 or more extra people, with the 30th Senate District in Lake County topping the list with an excess population of 73,072. Ten GOP-held House districts in suburbia were 22,000 or more over the population target, with the 60th House District in Lake County leading with a surplus of 44,020. In fact, 17 of 28 Republican senators and 25 of 46 GOP House members were in districts that exceeded the population targets. Thus, as Redistricting '91 began, almost four out of every five sitting Democrats were in districts which needed infusions of new residents, while almost three of every five Republican lawmakers could spare some of their familiar turf. That stark contrast ultimately proved fatal to any hope the parties could reach a compromise because Democrats were loathe to sacrifice their incumbents in the numbers Republicans felt were merited to draw a map that accurately reflected the state's changing demographics. The Democrats' dilemma became the Republicans' destiny when the winner-take-all drawing put Jourdan on the redistricting commission. While Edgar could criticize the purported constitutional shortcomings of the Democrats' legislative effort, the map produced by the redistricting panel's Republican majority scrupulously observed the most critical forms equal population and minority empowerment — while paying enough heed to lesser questions of compactness, contiguity and political fairness to pass judicial muster. One-man, one-vote? The GOP plan is virtually perfect: Every one of its 59 Senate districts has either 193,739 or 193,740 residents; the population of each of its 118 House districts is either 96,869 or 96,870. Minority representation? A prime directive for Republican cartographers was to draw as many districts as possible with supermajorities of black or Hispanic residents. Currently, there are seven blacks and one Hispanic in the Senate, while House membership includes 14 blacks and two Hispanics, all of them Democrats. The GOP mapmakers fashioned eight Senate and 18 House districts — one of them in the East St. Louis area — in which at least 65 percent of the population is African-American. The Republican plan also provided a relatively safe district for the Senate's only downstate black, Sen. Kenneth Hall (D-East St. Louis), in the 57th, where African Americans make up 36 percent of the residents. Defending their rival map, which contained one less black House district in Chicago, Democrats contended the GOP plan could cost minority seats because it placed too few blacks in some districts with strong ward organizations and white incumbents. (Though the courts did not heed the warning, the Democrats Large number is Senate district. Smaller, bold number is House district. For remaining districts, see maps on pages 11 and 12. proved accurate soothsayers: The March Democratic primary produced white winners in one Senate and six House districts with black majorities. Among the losers were two African-American incumbents. Reps. Paul L. Williams in the new 24th House District and Nelson Rice in the 28th.) The Republicans also crafted two Senate and four House districts with at least 70 percent Hispanic residents, percentages slightly higher than those contained in the Democrats' Hispanic districts. Compact and contiguous? In court pleadings. Republicans conceded some of their districts were oddly shaped, but they said the contortions were needed to achieve other goals, like equal population and minority representation. And they were all self-contained. The rival Democratic map, meanwhile, also contained its fair share of tortuous boundaries, leading state Supreme Court Justice James D. Heiple to conclude both were flawed maps, "drawn with a view to securing a partisan political advantage." Political fairness? Democrats complained about partisan gerrymandering, but the remap panel's GOP members concluded the "balance of political influence" provided by their map would "better serve the interests of the people of Illinois," a judgment neither the state court nor a federal panel felt compelled to contradict. Using a formula based on past voting history and incumbency. Republican analysts calculated their map would give the GOP the advantage in 30 Senate and 52 House districts, while Democrats would have an edge in 27 Senate and 54 House districts. The remaining two Senate seats and 11 House seats would be open and competitive, according to the study. Including the incumbency factor, however, understates the map's strong Republican base because there are more Democratic lawmakers, particularly in the House. In the GOP study, for example, 23 of the Democrats' 54 "advantage" seats in the House were actually competitive districts with a Democratic incumbent. On the other hand. Republican incumbents in competitive districts accounted for only 14 of 52 GOP "advantage" seats. An incumbent may retire or die at any time, or be defeated in any election, but a district's underlying political allegiance is likely to remain about the same for the decade. Measuring that allegiance solely by one traditional political yardstick — how well a party's candidates for University of Illinois trustee run — the map favors Republicans in 34 Senate and 69 House districts. In the Senate, the map creates 18 "safe" Republican districts, areas in which GOP trustee candidates averaged more than 60 percent of the vote in the last four elections. In nine other districts, GOP trustee hopefuls averaged between 55 percent and 60 percent, giving Republicans a solid edge in 27 districts. Using the yardstick, Democrats have 14 "safe" districts and eight other strong ones, for a total of 22 likely wins. So, assuming no upsets in their 27 strong districts. Republicans need to carry only three of the remaining 10 "swing" districts for a Senate majority, and GOP trustee candidates outpolled their Democratic foes in seven of them over the last four elections. The same barometer forecasts sunny skies ahead for Republicans in the House. The new map creates 38 "safe" GOP districts and 18 others where the Republican trustees averaged between 55 and 60 percent of the vote. That's a total of 56 seats where Republicans should be favored. House Democrats, meanwhile, can count on 31 "safe" and nine strong districts, for a total of 40. So if Republicans can avoid losing in the districts in which they have a clear advantage, they need to win only four of the 22 "swing" districts for a majority, and GOP trustees outpolled Democrats in 13 of them during the 1980s. Suburbia is the anchor for the map's GOP strength, paralleling Chicago's loss of political clout. Under the new map, suburban Cook County and the collar counties of DuPage, Lake, Kane, McHenry and Will gain six Senate seats and nine House seats, for a total of 24 in the Senate and 46 in the House. Thus, for the first time in state history, suburbanites will elect more lawmakers than either Chicago or downstate. Based on University of Illinois trustee results, 17 of the suburban Senate districts are safe Republican, while four others have strong GOP tendencies. On the House side, 32 suburban districts are safe Republican, while nine others strongly favor GOP candidates. Democrats have a strong edge in two suburban Senate and five suburban House districts, while the remaining suburban Senate.district leans Democratic in its trustee preferences. Chicagoans, meanwhile, are the majority in 14 Senate and 29 House districts, a loss of five Senate and eight House seats from those that city voters controlled for the last 10 years. Again using the trustee barometer, Democrats are solid in all the city's Senate districts and in all but two House districts, one leaning GOP and the other strongly Republican and McAuliffe's home base. Downstate, which lost one Senate and one House seat to the suburbs, retains more of a bipartisan look based on the trustee vote. Each party is strong in six Senate districts, although seven of the remaining nine districts lean Republican. On the House side. Republicans have 14 strong districts to the Democrats' 10, and also enjoy a slight edge in 12 of 19 "swing" districts. The Republican-fashioned hybrid districts serve dual political purposes: providing friendlier turf for GOP candidates and forcing Democratic incumbents into primary fights or unwinnable districts. By adding new suburban voters, for example, GOP cartographers sought to provide safer bases for the party's two Chicago senators, Dudycz in the 7th and Raica in the 24th, both perennial Democratic targets. The map also linked concentrations of black suburbanites to minority neighborhoods in Chicago to help create additional African-American districts rooted in suburbia: the Senate 4th and the House 7th on the west side and the Senate 15th and the House 29th and 30th on the south side. Not coincidentally, the move eliminated two suburban Cook County Senate districts held by white Democrats for a decade, leaving two incumbents — Sens. Ted E. Leverenz of Maywood and Richard F. Kelly Jr. of Oak Forest — in solidly GOP territory. Shorn of much of his Maywood base, Leverenz now faces a stiff test battle against Rep. Dan Cronin (R-Elmhurst) in the 39th Senate District, two-thirds of it in DuPage County. Kelly, who was mapped into the 18th Senate District, sought renomination from the neighboring 15th, which contained large chunks of his former district. But Kelly lost the primary to Rep. William Shaw of Chicago, an African American helped by the district's 65 percent black population. Other white incumbents also found their old districts carved up in the GOP push to create as many minority districts as possible. In all, 15 white Democrats from the city or suburbs wound up in districts with black or Hispanic majorities. Elsewhere in the suburbs and downstate, Republicans carefully apportioned Democratic strongholds among several districts, leaving a score of incumbent Democrats now running in territory that ranges from downright hostile to mildly unfriendly. After the remap scramble, a total of 14 Democratic lawmakers chose to run in districts other than the ones in which the new map placed them; 15 others opted for retirement. Cartography is but one of the political C's needed to elect legislative majorities, of course. Candidates, campaigns, coattails, cash — lots of cash — all play a role. While the new map provides a solid footing for GOP gains throughout the decade, its impact could be dulled on November 3 by other crucial factors. For example, Republicans are sure to lose some of the districts that seem theirs on paper, simply because their candidates are facing well-known, well-liked Democrats. Moreover, during the last decade Democratic leaders have proven better than their Republican counterparts at financing and running legislative campaigns. Perhaps the gravest worry for Republicans, however, is the prospect that President George Bush and U.S. Senate hopeful Richard S. Williamson will run so poorly that they'll drag GOP legislative candidates down to defeat with them. Even in that event, Republicans still have one huge consolation, though. Whenever the bell rings throughout the 1990s, they'll be playing on home ground. Charles N. Wheeler III is a correspondent in the Springfield Bureau of the Chicago Sun-Times and is a regular political columnist for Illinois Issues.